While I mostly review cutesy family-friendly films on my blog, I feel that now is the time to expand and also focus on more mature-themed motion pictures, since I don’t want to be pigeonholed as just a ‘kiddy film reviewer’ (though there is plenty of animated fare that isn’t really for kids). 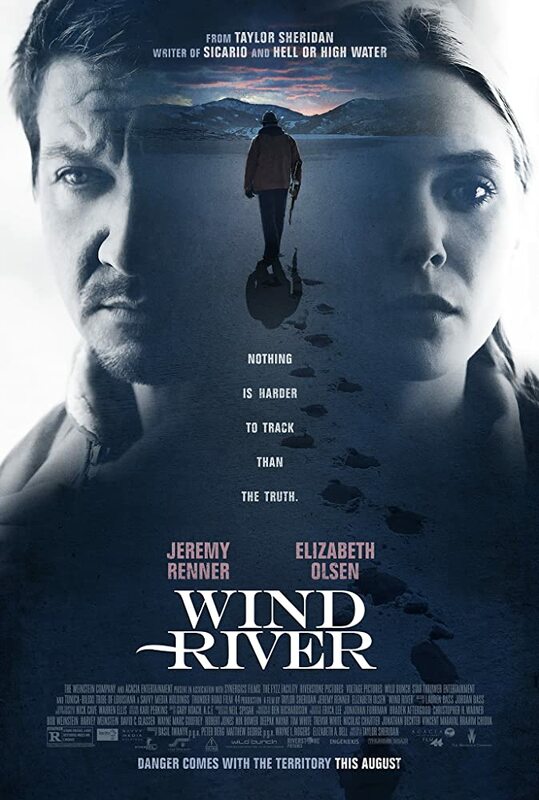 So I came to see Wind River as part of a club who one night went out to the local cinema. This was probably my first time seeing an R-rated (roughly equivalent to the 15 age rating) film with a group of other people in a public place, since all the films I’d seen with that rating before had been in the relative privacy of my own home. Just to clear things up: these are not Glasgow and Edinburgh from Britain Boys – they are two completely new characters with different personalities, looks and jobs. The year of 2014 presented Scotland with a double celebration – the Commonwealth Games in Glasgow and the then-hot topic of Scotland’s potential breakaway from Britain (which has now re-entered the public consciousness thanks to Brexit). Since I wanted to create something to both commemorate and comment (of sorts) on these once-in-a-lifetime occasions, I decided to invent a whole new series in the vein of Britain Boys which would be a kind of satirical sitcom on modern Scottish society. Because I struggled to come up with a name for this new series, I simply named it after the main duo of Glasgow and Edinburgh, although of course there would be a lot more characters named after Scottish places over the next few months. The drawing above is how I first imagined the titular duo to look like. I based their personalities and appearances partly on how their respective cities are popularly perceived in the media – with Glaswegians being seen as rough and tough, and Edinburghers being more into culture and sophisticated. When I first designed Glasgow, as seen above, he originally wore the stereotypical Scottish outfit of a kilt and black tap shoes with ribbons tied across the top of his socks. Although on the outside he appeared tough and prone to anger, inside he was jokey and always willing to have a laugh, even if it was at his own expense. Edinburgh, on the other hand, makes making people laugh his job. I based him being a comedian on the presence of the world-famous Edinburgh Fringe Festival, which is the favourite tour stop of many real-life comedians from across the globe. I tried to make him look hipster-ish with his beanie hat, man-scarf, black trenchcoat and tartan trousers, which also reflects the stereotype of the city of Edinburgh being an avant-garde centre for those whose tastes are slightly different from the mainstream. This drawing is the second iteration of the designs I created for Glasgow and Edinburgh. Edinburgh stayed mostly intact, but Glasgow was now a steelworker instead of just a figure of Scottish stereotype. This is because in the past, Glasgow was an epicentre for the British steel industry, as well as being the prime port of shipbuilding for such famous ships as the Queen Mary II. Though it has since dwindled greatly, it remains a point of pride for many Glaswegians, and the giant cranes overlooking the Clyde River have become the city’s landmark of sorts. I would later again dramatically change Glasgow’s outfit and overall looks and personality, which would become his ‘canon’ design, but Edinburgh remained fundamentally the same. Glasgow’s ‘new’ design will be revealed in the next exhibition. Abbotsford is a Canadian Girl who loves to sew. She carries a needle, various threads and pieces of fabric with her when she goes out to keep herself occupied. When she is at home, she designs her own outfits, using lots of fabric and her trusty sewing machine. Abbotsford is proud of her handiwork, and when she finishes an outfit, she takes it along with her so that the other Canadian Boys and Girls can admire her fashion style. Amherst is a 24-year-old Scottish-Canadian man. He wears a pale cream collared shirt, a light brown tartan kilt fastened with a belt and an amber bonnet on his head. He has a lot of thoughtfulness for his brothers, frequently bringing them little gifts like thistles, shortbread, scones and traditional Celtic jewellery. Amherst loves touching soft things, such as his pillow. Amherst is often seen vigorously playing his bagpipes, smiling compassionately. Antigonish is a 20-year-old Scottish-Canadian man. He wears a ruby-red jacket buttoned up in the middle, a bright red tartan kilt fastened with a belt and a rose-pink bonnet on his head. He is very short-tempered, having a mildly irritated face most of the time – but if he is provoked, he becomes terribly furious and starts to shout noisily, hurting other Canadian Boys and greatly upsetting them. Antigonish is fiercely proud of his Scottish roots. Antigonish is often seen angrily playing his bagpipes, frowning lividly. Apple River is a 24-year-old Scottish-Canadian man. He wears an apple-green jacket with a lime-green collared shirt underneath and an emerald-green tartan kilt fastened with a belt. He is kind, soft and thoughtful, considering other people’s thoughts and feelings and helping to rectify any problems that arise. He is the exact same age as Amherst and they share Scottish roots, so they are on very amiable terms with each other. Baddeck is a bagpiper and fiddler. He wears a deep-red jacket with a bright red collared shirt underneath and a vermilion-red tartan kilt fastened with a belt. He shows great aptitude in playing two musical instruments – namely the bagpipes and violin – and he travels around the city with both in hand, astounding crowds and making them dance the Scottish jig to his lively and heart-stirring tunes. Baddeck prides himself on his Cape Breton roots – he has a very strong ‘Caper’ brogue when he speaks and sings – and he says his hopes are to keep the culture and arts of his homeland alive through his musical talents and special way of singing. Banff is a young skier. He is sweet, and he goes down the slopes without any fear, since he was ‘born to ski’. He frequently visits the Canadian Winter Sports Centre with his brothers Jasper and Whistler to practise before going on the real slopes. Banff dreams of being a professional skier at the Winter Olympics. Barrie is an accident-prone 31-year-old man. He has a physically weak structure, so he is always getting injured from even the slightest blow, sometimes severe enough to warrant hospitalization. He is almost always seen with a sling, cast or protective healing application of some kind, with the remnants of the wounds peppering his skin. Barrie is also emotionally weak due to having developed over-sensitivity to the tiniest pang of pain, making him cry the second he feels it. Barrington is a wheelchair-confined 15-year-old with cerebral palsy. He is non-verbal and is always bent over the right side. He has a dish-cloth tied around his neck and a tea-towel spread across his lap to mop up saliva and spills. He always has an angry, serious look on his face. Barrington relieves himself in his trousers frequently, so he needs regular changing. He is tube-fed on skimmed milk powder mixed with water. His parents take on responsibility for attending to him and his desires. Barrington is very rowdy and unreliable, prone to bursting into furious fits of uncontrollable screaming, spitting and dribbling all over his clothes and making unintelligible noises. Barrington makes his parents’ lives complicated, but they also care deeply for him. Bassano is an acoustic guitarist with high-functioning autism. He always carries his ‘precious’ guitar around with him, strumming in a lively manner while singing in a clear, passionate voice. He has a habit of flapping his hands when he is excited, stimulated, or anxious. Bassano is a very positive role model for disabled Canadian musicians thanks to his talents of singing and playing the guitar. Blacks Harbour is a mildly surly fisherman. He lives on a large boat docked in the Canadian Harbour beside the beach, and he makes a living by going out to sea daily to catch some fresh fish to be sold at market. He is slightly angry most of the time, but if somebody goes onboard his boat without his permission, he becomes extremely furious and whips the intruder with his fishing rod, shouting at them raucously, causing them to bleed excessively, and badly depressing them. Blacks Harbour lives ‘next boat’ to his brother St. John’s, who is just as cantankerous as he is. Bountiful is a black 2-month-old. He is cared for by his parents Keremeos and Port Renfrew. He is quiet, and considering he is very young, he crawls. Keremeos and Port Renfrew are slightly worried about him being disabled. He relieves himself in his pants frequently, so he needs regularly changing. His parents take great care not to damage his easily-breakable bones when they handle him. Bountiful already has a sense of his identity and knowledge of his parents. Bountiful sleeps with Keremeos and Port Renfrew in their king-size bed at night. Bracebridge is a 15-year-old. He is in love with a young Scottish-Canadian man named Sambro, and he is very kind-hearted. He speaks with a sweet voice, using a lot of endearments, such as “dear”, “sweetheart”, and “my sweet little dearie”. Bracebridge shows a lot of care towards his boyfriend. Bracebridge thinks of Sambro as his “beloved little sweetness”. Bramalea is a 13-year-old. He is cared for by his father Brampton, and he is very shy, so he is often seen hiding behind his father’s back, shuddering. He cannot talk either, so he must communicate in the same ways that Saint John uses. He cries a lot, often for tiny things, which bothers Brampton as he thinks he is suffering from depression. But the other Canadian Boys tell him it’s just ‘normal teenager stuff’, so Brampton isn’t overly worried about his son, but he still feels a little concerned. Bramalea frequently clings to Brampton, thinking of him as the ‘love of his life’. Brampton is Bramalea’s father. He cares for his teenage son, comforting him when he cries. He clearly loves him a lot; he uses a range of endearments when he talks to him, and he strokes him sweetly, showing him a great deal of affection. Brampton thinks of Bramalea as a ‘mini-me’ version of himself, and his ‘heir’. Brandon is a 30-year-old man. He has a wife named Portage La Prairie, and he cares for her, helping her to live her daily life. He shows his love for her by kissing, stroking, using a variety of endearing terms when he speaks to her, and comforting her when she is feeling glum. He thinks of her as his ‘sweet love’. Brandon sleeps at Portage La Prairie’s side in their double bed at night. Brantford is a 25-year-old. He is married to a young black woman named Mallorytown, and he cares for their baby mixed-race son Smithville. He feels a lot of affection for his dark-skinned wife and his ‘dear little black one’. He speaks very kindly, using a lot of endearments such as “dear”, “sweetheart”, and “my little honey”. He strokes his soft skin to show his sweetness. Brantford sleeps with Mallorytown and Smithville in their king-sized bed at night. Burford is a 15-year-old with a prosthetic left arm. He became this way after his parents discovered his ‘real’ left arm was developing gangrene, so he had to have a surgical amputation and prosthetic replacement. He has lived his life with a prosthetic joint ever since. Burford is independent. He can dress himself, cook his own meals and care for himself. Burford holds a positive mind – he says that nothing will ever let him down just because he has a prosthetic joint. He is an optimistic young disabled Canadian Boy who is always looking on the bright side of life. Burlington is a slightly disadvantaged young teenager. He is totally paralyzed on the left-hand side, so for instance, he cannot move his left arm or leg as they are always glued to his body. He was left like this after he was knocked over by a car one afternoon, and he will never be able to live his life the same way as before. Thankfully, however, Burlington can still move his right-hand side, but this means he cannot walk properly, so he has to drag himself around. He can only handle things with the right-hand side of his body. His left-hand side cannot be touched – if it is, he will feel excruciating pain. Burlington is cared for by his mother Milton. Calgary is an eight-year-old boy. He is very obedient, though of course he does sometimes misbehave. One of his favourite words is “guy”. When he is with the other Canadian Boys who live in the Canadian Boys’ House, he says “Come on, guys, we gotta do this,” and if he finds something lost or unusual, or when he is excited, surprised, sad, distressed or angry, he says “Oh, guy.” He frequently calls one of the other Canadian Boys “guy” too instead of their real name, and occasionally he even calls animals and inanimate objects “guy”. Calgary has an excellent memory in recalling sights and sounds. Calgary is cared for by his father Edmonton. Campbell is Judique’s first bandmate. Genial and peaceful, he performs with Judique and fellow fiddler Lime Hill at ceilidhs around the city. He is easily irritated, however, and he becomes dreadfully angry if he is pushed to his limits, shouting noisily, cursing and slamming his fist down on hard surfaces, like a table. He has a noticeable Cape Breton twang when he speaks, just like his fellow fiddlers. Campbell is always looking out for his bandmates and encouraging them to fiddle as much as their talents have blessed them with. Campbellton is a soft-hearted young Canadian Boy. He is often seen laying down on his stomach with a kind look on his face. When he speaks, his voice is sweet, rich in endearing terms – especially the word “dear”, which is his favourite. Campbellton loves it when miserable Canadian Boys and Girls come up to him, meaning he can soothe them with his caring nature. Cheticamp is a 26-year-old Acadian man. He wears a traditional Acadian costume decorated with the tricolour flag and golden star pin badge. He is bilingual, speaking both English and French, and frequently blending the two languages together when he speaks to create the distinctive Acadian patois. Cheticamp loves consuming Acadian delicacies, thinking of this cuisine as his ‘patriotic grub’, which makes him feel very proud of his Acadian heritage. This pride of old Acadia, its people and culture also shows through his clothing. Chicoutimi is a milkshake vendor. He runs a stall at the Canadian Park, and he blends only the finest organic ingredients for his milkshakes and smoothies. He is fluent in both English and French like most French Canadian Boys in Canadian Boys, speaking English to Anglophone customers and French to Francophone customers. He often mixes the two languages together when he speaks. Chicoutimi has a canopy on his stall which he can lower down to continue conducting business when it’s raining or snowing. Churchill is an explorer. He wears a brown leather jacket with fleece made from polar bear fur, and he often goes out in winter when there is lots of snow, so he can learn about what goes on in the city and its natural habitats during the colder months. During the rest of the year, he visits the House of Winter at the Canadian Seasons Centre to continue his ‘winter studies’. Churchill gets around the city in winter on his snowmobile, which can navigate even the snowiest or iciest of roads thanks to the grips on the base. Clarenville is a 15-year-old boy. He has a very sweet nature and speaks with a kind voice, using lots of endearments when he speaks. In the summertime, he is frequently seen at the Canadian Park snuggled up in his sleeping bag with his girlfriend Miramichi, enjoying the warmth of the sun shining onto his face and blissfully humming to himself. Clarenville loves the sweet scent of flowers in spring, often giving a bunch as a gift to Miramichi to show her how much he cares for her. He lives with her at their home in the northeast of the city. Cobourg is a black wheelchair-confined 13-year-old. He is cared for by his parents Port Hope and Grafton, and he does not speak. Very unreliable, he has a variety of habits like making weird noises, spitting and dribbling all over himself, and flapping his hands crazily. He wears a tea-towel around his neck to mop up saliva. Cobourg relieves himself in his trousers frequently, so his parents need to change him regularly. He is tube-fed on skimmed milk powder blended with water. Cobourg puts a heavy burden on both of his parents, but at the same time they care so much for him. Consort is a librarian. Daily, he takes books from his patrons to either lend them out, renew the lease or check them back in for somebody else to borrow. If someone is doing research – whether for their study projects, field trips or just out of personal curiosity – he will offer them guidance in finding the right shelves and resources for the subject, extracting the appropriate information, and referencing for essays, theses, dissertations and other literary works. Though he may seem cold and hard-hearted on first impressions, deep down he genuinely does care for those who use the library and see it as a valuable community asset. Consort shows a concern for the rise of electronic books and reading devices, claiming that nothing can ever compare to the feel of paper, the true portability of a print book, or the hard work and rewards that come with traditional methods of researching. Coquitlam is a swimmer. He visits the Canadian Leisure Centre daily to have some ‘aquatic fun’, and he loves it when the big waves are activated and everybody tries to get out of the way, but they end up getting knocked back down into the water. When the weather is warmer, he goes swimming at the beach, often having friendly encounters with marine animals such as whales, dolphins and even sharks. Occasionally, especially in the summer, he goes to the Canadian Water Amusement Park. Coquitlam warms himself up in winter by visiting the Canadian Hot Springs, which pack a pleasant heat even in the coldest of weather conditions. Cranbrook is a peaceful young man. He loves to relax in his ‘sweetheart’ armchair that he treasures so much, keeping a collection of books by his side so he can delve into a “good old story”. He drinks a lot of tea as it is his favourite beverage, and he likes to dip biscuits into his ‘brew’ then munching away on them pleasantly. Cranbrook enjoys the sensation of soft things, and he often strokes his pillow, greatly pleasing him. Dawson City is a First Nations Canadian Boy. He pans for gold in the water bodies of the city – he has struck gold on a few lucky occasions – and kills fish to eat raw. He sometimes even kills seals and walruses for raw consumption. Dawson City carries a silver-headed spear to kill animals and dig for plants, fungi, historical artefacts and precious stones and metals. Deseronto is Toronto’s father. He wears glasses and carries a dark walking stick with a blue rubber bottom. He knows, along with his wife Napanee, that his son is famous because of his dancing and singing talents. Toronto often comes to visit him and Napanee at their home, and Deseronto says he is very proud of his son, thinking of him as a ‘gift from God’ who has come down to Earth to entertain people with his songwriting and choreography. Deseronto loves to listen to the radio with Napanee, and if one of Toronto’s songs starts playing, he whispers to her that it’s their much-loved son expressing himself with his creative talents. Digby is an angler. He always carries his ‘beloved’ fishing rod about with him, and he goes fishing daily at water bodies around the city. Most of the fish he catches are common species such as cod and trout, although occasionally he catches exotic fish such as catfish and clownfish. Digby carries a mini-book entitled ‘Fish of the World’ in his left jacket pocket for quick and easy reference and identification whenever he goes fishing. Digby has photographs of him carrying special ‘new catches’ and trophies gracing his bedroom – he feels very proud of all the angling he’s done over the years. Doaktown is a young grape cultivator. He lives in a big barn-like house beside the Canadian Vineyards in the southwest of the city, and he picks juicy grapes off his trees every day, storing them in wooden barrels to prevent spoiling. He believes in growing produce as organically as possible, so he does not use any harmful chemicals or genetically modify his crops, and he ensures he is paid a fair price for each bunch of grapes. His grapes are sold at stores and markets across the city. In addition to grapes, Doaktown also makes juice, jam, raisins and wine, although ironically he is teetotal. Doaktown enjoys the scent of freshly-ripe grapes and grapevine leaves, and he keeps some stuffed under his pillow to sniff the sweet aroma. Don Mills is a deaf wheelchair-confined 20-year-old. He cannot hear at all, nor can he speak, so he communicates using sign language. He always has an annoyed look on his face. Don Mills relieves himself in his pants frequently, so he needs regular changing. He is tube-fed on skimmed milk powder mixed with water. Don Mills is very fickle, spitting and dribbling all over himself, jerking and wriggling about in his wheelchair and flapping his hands uncontrollably. He wears a tea-towel spread across his lap to soak up saliva. Don Mills exhausts his father greatly, but he also cares a lot for him as he is his son. Dorval is Laval’s father. He cares for his daughter when she is at home, showing her a lot of affection. He understands that she loves Montreal and wants him as her boyfriend, but he also understands that Montreal hates her endlessly chasing him, causing him much distress and crying. So he tells her that no matter how much persuasion Laval tries out on Montreal, he will never want to be her boyfriend. This upsets Laval a lot, making her cry too, but Dorval says she should accept Montreal’s choices and let him live his life. He speaks both English and French, often blending the two languages together when he speaks. Despite Laval’s mischievous antics, Dorval loves her greatly, and she says the same to him. Drumheller is a geologist. An avid excavator, he spends warm days outside in vast fields, at the beach or on a mountainside digging for precious stones, ores and fossils. If he finds any valuable spoils, he gets overcome with excitement and goes all out to try and attract as much attention to his ‘epic finds’ as possible, sometimes resulting in selling the artefacts to museums or other cultural institutions. Because of spending so much time out in the sun, he has developed a slightly dark tan. Drumheller acts as a villain for the show because of his desire to race for treasures before his competitors and earn as much money as possible from pawning them off, leading to him being branded as ‘the new Fredericton’. He does not like to see others making discoveries of their own, and he will always try to get the credit for it even if he played no part at all. Drumheller has been known to dig under people’s homes because his metal detector or geological surveys of the surrounding area told him there was something interesting hiding there, causing much anger and annoyance to the residents. Dryden is a survivalist. He wears a bulky puffy blue jacket and a pair of wool-lined leather boots and carries a pickaxe for hanging onto mountainsides, breaking rocks open and uprooting trees for lumber and firewood. Through lots of camping excursions out in the wild, he has learnt to forage for wild fruits, angle for fish and boil a refreshing cup of tea using just water over a log fire and freshly-picked tea leaves. For something meaty, he goes hunting for big game like deer, moose and pheasants. In winter, he gets around on snowshoes, skis and his trusty snowmobile while his jacket, thick trousers and boots keep him pleasantly toasty, and he melts fresh snow and ice to use for water. Dryden does not fear nature – he says that because people spend a lot of time in technologically-advanced urban environments, they have become somewhat reluctant to re-engage with the natural world – and he feels a sense of inner peace when it’s just him, the fire crackling away, and the water bubbling as it flows out across the land. Dunville is a slightly elderly Irish-Canadian fisherman. He lives aboard a big houseboat docked at the beach beside the Canadian Meadows in the southeast of the city, and he goes out to sea daily to catch some fresh fish for sale at market, practising sustainable fishing techniques. Dunville is very kind. He speaks with a sweet voice, using a lot of endearing terms like “dear”, “sweetheart” and “my pleasant little b’y”. In addition to fish, he catches crabs, lobsters, oysters, clams and mussels. Dunville has an adult son named Harricott, whom he shows a great deal of affection toward. Edmonton is Calgary’s father. He loves to make his son laugh with his great sense of humour, and because Calgary is so obedient, he rarely gets angry. He is somewhat obese because he eats a lot of fast food, such as burgers, pizza and fried chicken. Edmonton loves to play the ‘Tree Game’ with Calgary, where he pretends to be a tree and Calgary tries to climb up him, often falling, with laughter and lots of utterances of “guy”.